I have always loved Valentine's Day. Growing up, I thought it was "my" day because my last name was "Hart." Didn't matter that my name wasn't spelled with an "e." It was my day. I always loved anything in the shape of a heart, and accumulated quite a collection over the years. And at an early age, I started drawing a tiny heart next to my name whenever my signature was required. Over the years I've probably signed my name to more than a thousand Valentine's Day cards. I'm sure I started sending them out when I was in Kindergarten, but I don't remember. My son has been sending out Valentine Cards since he was two years old. His very first Valentine was sent to family and friends. It was a photo card with him sporting a onsie with a special message: "heart breaker." 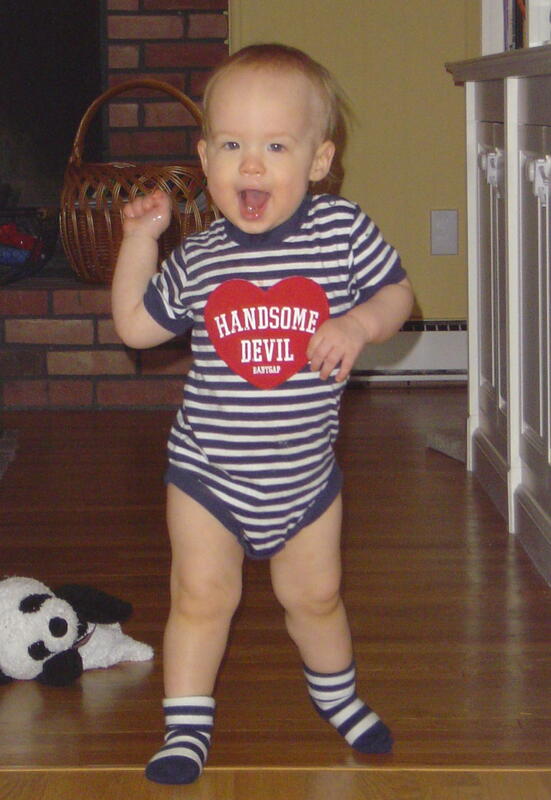 In honor of Valentine's Day, and my little Valentine, I thought I'd share that photo. Everyone loves a cute baby pic, right? When my son started preschool, I would hand-make the Valentine's he gave to his classmates. It was always fun to come up with a theme. As he's gotten older, he's wanted to choose his own. And as his current interests change, so have his Valentine's. We given out Thomas, SpongeBob, Hot Wheels, and this year, Angry Birds, which he allowed me to make. I found clip art images on the Internet and added my own sayings. I captioned one image of a pig with a bow and arrow shooting hearts: "I'm aiming for love, Valentine." I know it sounds old fashioned, but I like the Valentine's of my youth that were sweet and innocent. 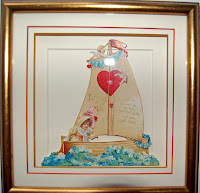 Like the vintage Valentine I bought for my husband one year that I had framed. It's a scene of a young girl sailing. 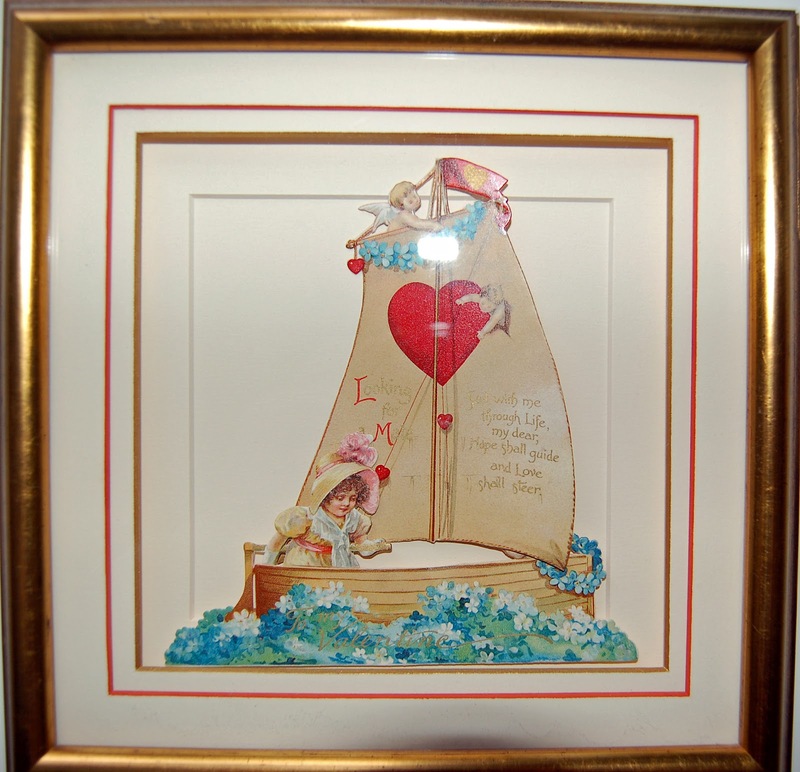 On one sail, she says "Looking for a Mate;" on the other there's a poem: "Sail with me through life my dear, Hope shall guide and love shall steer." In honor of my big Valentine, I thought I'd share that one, too. Soon I'll be off to the hospital to visit my mother who is recuperating from total knee replacement surgery. I'll be bringing her a red heart-shaped box filled with chocolates, a card, and flowers. When it comes to Valentine's Day, I guess I'm just old fashioned at heart. Make that Hart. Happy Valentine's Day to all the moms! I saw lot of posting but this post is very different. I LOVE U R post. Great effort.